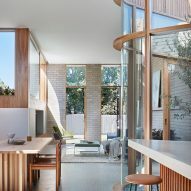 Local architecture studio Wowowa has renovated a Victorian house in Melbourne and added an extension with a scalloped brick facade that contains an open-plan living space. 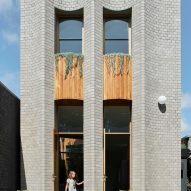 The practice was invited to oversee the modernisation of a property in the city's Fitzroy North neighbourhood by a client who had watched one of a series of YouTube videos produced by Wowowa about improving Melbourne's heritage properties. 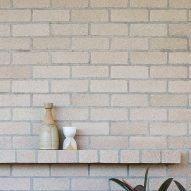 The house's original Victorian frontage features a decorative brickwork pattern known colloquially as "tiger prawn" due to its predominantly pink colouring, which the owners wished to complement with a similar-looking rear extension. 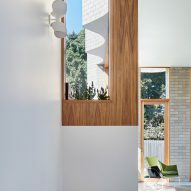 "The brief called for a mirroring of the robustness, craft and ornament of the front out the back, in the spirit of cohesion and reinterpretation of the existing visual language," said the architects. 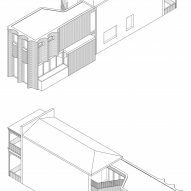 The first step was to create an extension that mirrors the plan and proportions of the terrace frontage. 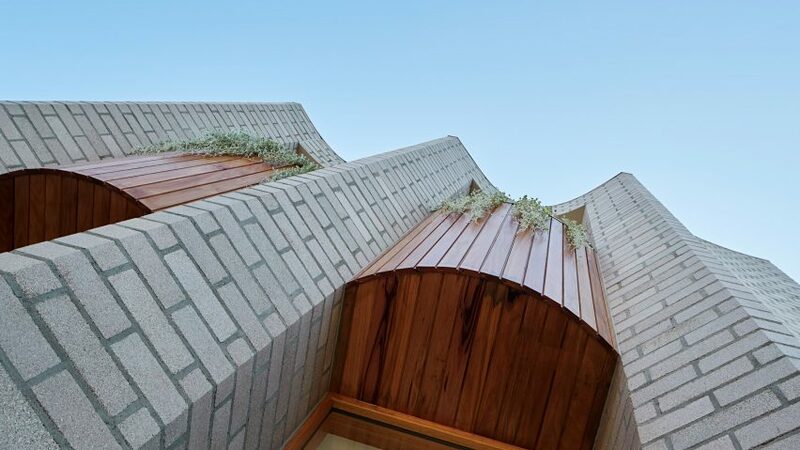 This volume was then sculpted to create the scalloped form, which provides optimal daylight conditions and creates flexibility in the internal spaces. 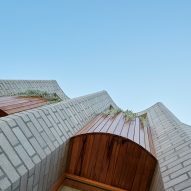 The fluted facade is informed by the ridges on a prawn's shell and is clad in brickwork with grey and green hues that also evoke the crustacean's natural colouring. The masonry extends around a corner just one metre from the boundary of the narrow site. 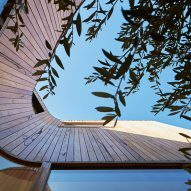 This allows the neighbours to appreciate its dramatic geometry and also facilitates the integration of large north-facing windows. Windows are set back into the facade and balconies containing hanging plants are integrated into the recesses. 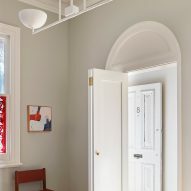 The existing Victorian interior comprised a typical sequence of cramped and dark rooms, which were mostly removed to create a more contemporary open-plan space. 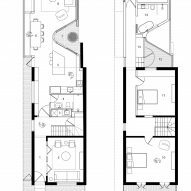 The reconfigured plan includes a seamless space that extends towards the garden and contains a series of distinct zones arranged around a protruding courtyard. 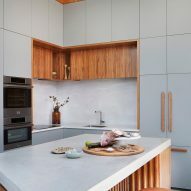 "The whole family can now be in any kitchen, living or dining nook, divided by courtyard and spatial play, but feel a sense of retreat," the studio added. 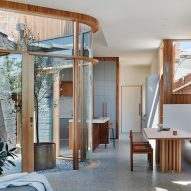 The new living space accommodates a kitchen and lounge positioned on either side of the V-shaped light well, which is enclosed by curving glazed walls. This intervention helps to break up the overall mass of the space whilst maintaining visual continuity throughout the interior. 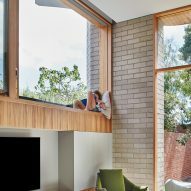 Its position on the southern boundary also allows daylight and natural ventilation to enter the room. An additional outdoor space on the upper floor is achieved by incorporating a small deck on the roof above the kitchen. 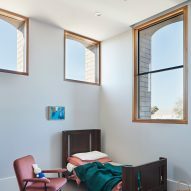 This terrace is accessible from an existing window off one of the bedrooms, or using a small set of steps leading from a corridor next to a new bedroom in the extension. 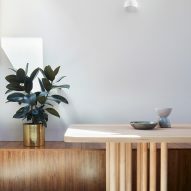 Earlier this year Austin Maynard Architects overhauled a dilapidated horse stable in Fitzroy to create a family home, while Ritz & Ghougassian created red-toned interiors for the Bentwood cafe in the suburb.